It was just after an incident involving a young lady who had an Aspergers diagnosis. From what I can tell she was in the middle of a meltdown. She was holding a knife, and had threatened self harm. In their efforts to resolve the situation, apparently a police officer felt threatened, and the young lady was shot. She died. (I apologise if I do not have all the details of this story right, it is my understanding from the news reports I saw. If I am incorrect, please let me know) I believe that if the police had known better how to help an Autistic person experiencing a meltdown she would still be alive. But they don't. So I had a chat with my son. I told him that no matter what, if he is confronted by police he must do what they say. If they say put your hands up, you put your hands. If they say put your hands behind your back, you put your hands behind your back. If they put handcuffs on you, you let them. If they say get in their car, you get in their car. Even if you don't know why. I told him that no matter what, if he is confronted by police he must do his best to speak aloud, even if he feels like he can't. I told him that no matter what, if he is confronted by police he must try not to stim. I told him that no matter what, if he is confronted by police he must try to point his face in the direction of their face. I told him that no matter what, if he is confronted by police he must not yell. I told him that if he could not do those things the only safe thing for him to say is "I am Autistic. I need help." I told him it might be a good idea if we make a card for him to keep in his wallet that explains he needs help with communication and they should call me immediately. He listened. He took it in. He didn't remember it. We had to have the discussion again. He asked, "is it OK to ask what I did wrong?" I had to say, "probably not". I told him that probably the only safe thing for him to say is "I am Autistic. I need help." You might think this is an over reaction. But Autistic people are way too often hurt by police who do not understand how to help someone who does not have the ability to advocate for themselves in the way the police are expecting. My son is about to turn 16. He is tall. He moves awkwardly. He speaks atypically, more so when upset, and can lose the ability to speak if particularly stressed. To a police officer who doesn't know what they are looking at he could seem threatening. I know not all police offers are "bad". But I also know of many many instances in which Autistic people have been tasered or shot because the police assumed they were dangerous when they did not react "normally". 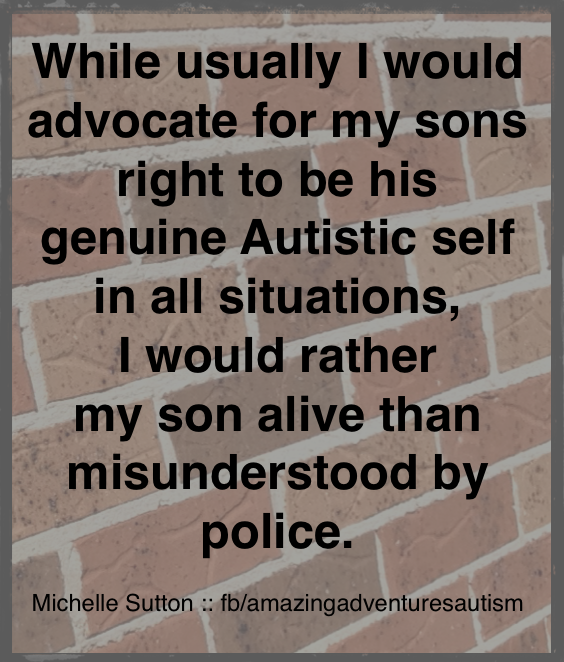 While usually I would advocate for my sons right to be his genuine Autistic self in all situations, I would rather my son alive than misunderstood by police. And it felt like betrayal to tell him that it is probably not safe to be himself in front of people we should be able to trust to protect him. At least I didn't have to tell him that his skin colour was working against him as well. There are many others who have discussed the intersectionality around Autism and skin colour much better than I can. My son knows of the privilege he has as a white person. He knows the discrimination he faces as an Autistic person. Now he knows the dangers of looking Autistic in front of police. And all I can think is that it is all so very wrong. I had chills throughout this post.